A report listing a subset of records, sorted. Page contents © TK Boyd, Sheepdog Software, 9/14. A simple report: A subset of your records, sorted. While that's a pretty trivial case, I hope you will see that it captures the essentials of many much more significant database applications. Working with dates is a good way to get a headache, so I usually go around the "build in" functions, and just use a text string in the form yymdd. And yes, you really do have to read this section of "vegetables" if you are going to get any benefit from the "desert" to come. As it happens, I've used the "date" field for this table's primary key. Every table needs one, but the fact that the "date" field is the primary key for the table isn't important to what is to come. I wrote the bulk of this September 3, 2014. I used a Windows XP machine. 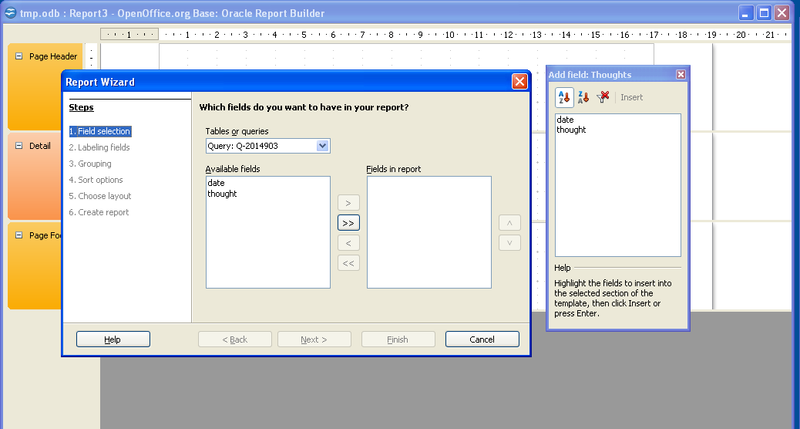 When I started, I was using OO 3.4.1, and the sun-report-builder. The tutorial was inspired by work the previous day on a Windows 7 machine, with a different OO and a different Report Builder. In what follows, I will show you a way to select, by their dates, just a sub-set of the records in the table, and then present them in a nice report, sorted by date. This should be a trivial task, but somehow it took me five hours the other day. Sigh. I hope you will see this tutorial in time to save you a similar "entertainment". I would also like to mention that this tutorial will be a little different from a "typical" Sheepdog Guides Open Office tutorial... some hand-holding will be skipped. The report generator built into the basic Open Office package is, forgive me, flawed. I have wasted many hours over the years struggling with it. I hate to speak ill of what is, overall, a superb package. And the basic report generator is a glass 90% full. Once you have installed it, the basic Open Office package is modified, and when you elect to use the wizard to create a report (as you should), it will be the Report builder's wizard which is invoked. 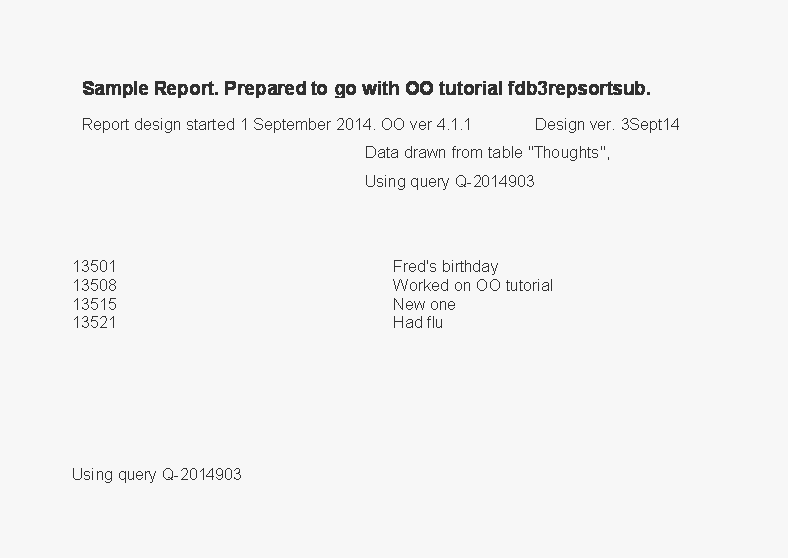 Use Report Builder to present the subset, sorted. ... which will work just fine to give me what we set as our goal: Just the records for May 2013. Remember: You and I know that "13431" is standing for April 31, 2013, but to the computer is it just a string of characters. But because of how we are coding dates, all will be well. ARGH!!! That should have been simple!!!! I did something JUST like that yesterday. But today, although I went through the wizard twice, it just "threw away" my search conditions. I had to go into the roughed-out query with right-click/ edit from the main Open Office project manager window, and tweak the query as follows. Notice: Two columns for the "date" field, but the "visible" property selected for only one of them. Once we have created the query and the report, if, at some future date, we want, say, a report of our thoughts for February 2014 (assuming some records have been entered for that period), all we do is to go into the query, edit the search conditions, and re-run the report. I hope that is enough help for you to set up the query we need? Do write and "complain" if not... if you've already looked at my existing guides to queries. So. We have some data in a table. We have a query which will pull a selection of records from that table. Queries, by the way, can be seen as a way to create "scratch" tables for sundry uses... such as being the "input" to a report. Now onward to the basic report, and then a few notes on Things You Can Do to make your report more "professional". I hope you noticed what I said above: Save your blood pressure: Use the Oracle Report Builder Extension (Add-On). Go to the main Open Office project manager window, select "Reports" in the left hand pane. 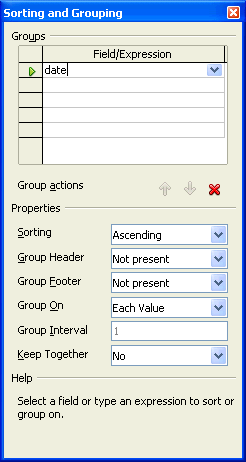 Invoke "Use wizard to create report". In the first step, "Field Selection", select query Q-2014903, and move both of the fields ("date", "thought") to the "Fields in report" box. The default layout will be fine, but select "portrait" orientation. Finish up by giving the report some name. I've used the rather basic "R-2014903" in running this process as I write the tutorial for you. It is a pity that the basic, done-with-the-wizard sort doesn't work. But we can get what we said we were going to get, with only a few minor pains to endure. It would be nice if we could just tick a box somewhere and tell the report "sort the records".... but it isn't quite that easy. But not a lot more difficult. The "date" and "thought" column headings are, at the moment, part of the "Header" band of the report. When we turn on sorting, "things happen". So, before we get into how to turn on the sorting, we'll move those headings from the "special", "headings" band into the bottom of the page header band. 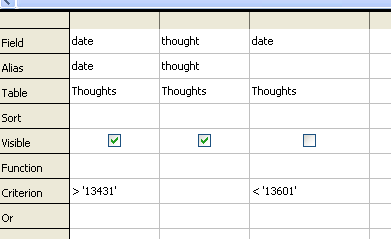 In a moment, we will select the two label fields (text boxes) ("date" and "thought". Once they are selected, we can just drag them to the Page Header band of the report. As with so many things in OO, how it works actually works very well... once you understand what is expected. To select stuff, you just drag out a box on the window. "The trick" to OO selection is to understand that unless an object is entirely within the selection box, it will not be included in the selection. Also, you need to know that the two label fields are much bigger than the text in them would require. Get the report open for editing, if it isn't already, and just click on either column heading. See the eight green drag spots? See how big the field is? Drag out a box around ALL of the two label fields. It doesn't have to be precisely done. BITS of other objects can be included, as long as you don't include ALL of those other objects. Once you've got a set of nine small green squares around both "date" and "thought", move the mouse pointer inside the selected items. Get to the right spot, and you get a four headed "move this" icon. Drag the headings into the "Page Header" band. Whew! Easy to do (when you know how.) Hard to convey with text. NOW we can turn on the sorting. That's IT!! We've DONE IT! I took five hours to get that right yesterday, for the first time, on a different machine. Today, to do it again on an older machine, which started with out-of-date OO and modules, and write most of this tutorial... another 4 hours. Sigh. And you'll be able just to sail straight to "the answer"! Don't despair. OO is a great package. It would be a great package if it cost what Access costs. But ANY database work is going to be more demanding that basic spreadsheet or word processing work. You CAN do it! So far, so obvious, up to a point. What's in the page header band will appear at the head of each page. What's in the page footer band will appear at the foot of each page. The detail band shows how EACH record will be handled in the course of producing the report. If the report consists of the data from, say, five records, then what's in the detail band will appear five times, with different values in the different field boxes. Before I expand upon the above, and before you do too much work on your report's fine tuning, be sure to check what you see when you call up the Format/ Page dialog. I often find I'm having trouble making everything fit... reducing the margins gives you extra printable area to fill. This is also where you can change the report's orientation to portrait or landscape, as appropriate. Okay... back to the main report design window. Note that each band has a certain vertical height. But you CAN, within limits, change the size of each section. Put enough space to be sensible at the top and bottom of each page by adjusting the height of the Page Header and Page Footer sections. You will probably want to shrink the Detail section as much as possible, to put as many records as possible on each page. But if you want a little space between lines, that's possible too... just make the Detail section a little bigger than the minimum allowed. There are icons to shrink whatever section currently has focus, i.e. is selected. If clicking on the section names isn't "doing it" for you, you can use the Report Navigator. I've said "within limits" a number of times. If there's nothing in a section, you can shrink it to nothing. If there is, for instance, a label field saying "date", then shrinking of the section is constrained. You must leave enough room for the label field... but you can change the size of the label field. Using a smaller font for what's in it is something you will do from time to time, for instance. If you have one of the sections selected, one of its properties is its height. You can make a section taller by making a change to the number in the "height" property's line in the properties panel. When a section is not "shrunk" to the minimum possible height, it is fairly straightforward to drag objects which are part of the section around on the available area. You will be prevented from making things... or even the area set aside for them... overlap. But you can often reduce the area set aside for something. Changing the height of the bands is fiddley, but you can do it. A quick way to add new label fields to a section is to select an existing one, do "copy" (ctrl-C is a quick way), then do a "paste" (ctrl-V), drag the resulting copy of the first label field to where you want it, and alter the text in the label field to suit your wants. Notice in the above that I have modified the font of the text in the different label fields to emphasize the most important text. 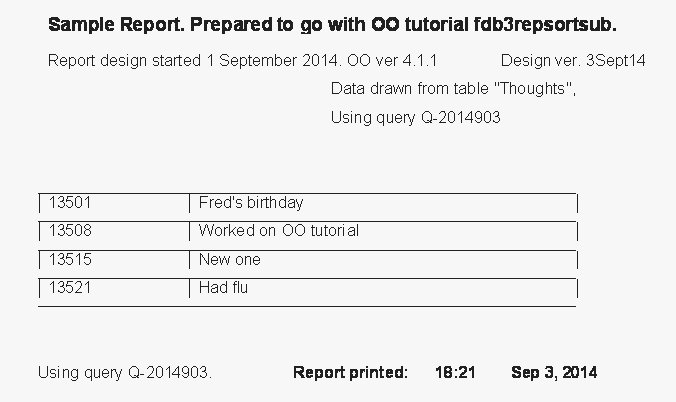 Not only can you put simple text onto a report, you can also add lines. In particular, lines between records may be welcome. I'm afraid I don't know how to do, say, a line every fifth record... but I'm sure it could be done. A little cunning is required to get a good result. If you put a line UNDER the data in "detail" section, then a line at the bottom of the Page Header section will provide a line above the first record, which will look sensible. Making the line under the data fit up tight against it, vertically, can be tricky. Again, simply edit the number in the properties pane. Try to make the line's Y-position "0" (zero), and the system will make it the minimum acceptable value. A lot of fiddley stuff... but necessary for a good report. And doing it gets easier and easier, with a little practice. I like to know when a particular bit of hardcopy was generated. If you have, say, two lists of what books are supposed to be on a particular shelf (assuming for the moment you are working with a library inventory database), it is a Real Help to know which list is the most up to date! Fear not! Open Office has anticipated this want! Click in the Page Footer section. Invoke "Insert" from the main menu. Choose "Date/time". Leave both tick boxes ticked. Click OK. That will place two "formatted fields" on the report, fields which draw information from the computer at the time the report is generated. Move them to sensible places. Re-size them. Add the label field saying "Report printed:". So. There you have it. Getting everything "just so" is fiddley in places. There are a few "gotchas". But OO is more than capable of turning out this sort of oft-needed report. If you haven't done something like this before, it probably was a bit of a struggle... but most of it, if you are like me, was in dealing with the initially frustrating system of selecting things, moving them about, changing their properties. With just a little practice, those irritations would fade. Master that "first bump" on the learning curve, and you will have a powerful tool at your fingertips. I am sure that it would be quite simple to build something which would allow you to call up something on your screen, fill in the start date and end date you wanted your report to cover, click a button, and the editing of the query would take place automatically, behind the scenes, and the report would "magically" appear on your screen. See my thoughts on "programming" with Open Office, if something like that sparks your imagination and ambition.